Sessions (also called visits): A session is any one person visiting your website any one time. If someone visits your site ten times in a week, those visits count as ten sessions, whether she stayed on the site for 5 minutes or 50. Unique visitors (called uniques if you want to sound terribly professional): A unique visitor is any one person visiting your website any number of times during a defined period. If someone visits your site ten times in a week, she still counts as only one unique visitor. 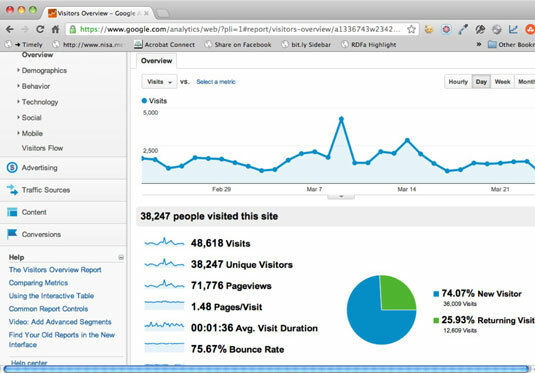 Page views: A page view is any one visitor viewing one page of your site, one time. A page must have a unique address, or URL. If someone visits your homepage but then clicks a link to your Contact page, those are two page views. Time on site: This is the total amount of time one visitor spends on your site in the course of a single session. Average time on site is an invaluable measure of visit quality and visitor interest. Referrers: If someone clicks a search result link at Google and lands on your site, Google is known as the referrer. Any traffic-reporting toolset — even the most basic — must provide these five metrics. If yours doesn’t, replace it. These five metrics typically show up right on the first page — the dashboard — of your traffic-reporting package.